On Eagle’s Wings – Welcome to InflatedStory.com! The seeds of The Inflated Story of Noah began germinating in my mind around 2002, but the first on-location, large-scale, balloon sculpture didn’t happen until the middle of 2007. I hadn’t traveled extensively in the intervening years, and my ideas were still taking root. 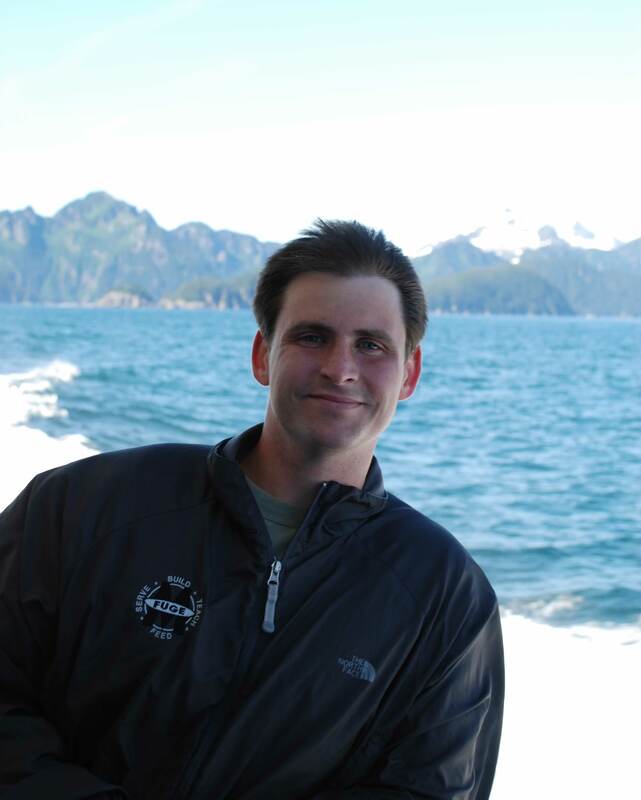 In 2007, I traveled to Alaska with my parents. I was about a year into my first full-time job and it seemed like a good opportunity to share this time with the people who loved, raised, and encouraged me for so many years. I knew I wanted to start sculpting for the book, but until it was almost time to leave for Alaska the eagle sculpture was a mere whisper in the back of my mind. For one thing, in order to attempt this inflated story, I knew I needed to invest in a much better camera. Alaska seemed like just the excuse I needed. I’d be able to take pictures of the scenery AND the sculpture. Some people are true photographers while others make a point to take a ton of pictures with an excellent camera so at least one of them is bound to be great. I’m the latter. After researching extensively, I decided a Nikon D80 was the best balance of price and quality for me. So, armed with a fishing pole, fishing line, the right balloons, and my new Nikon D80 set to “auto”, I was ready to tackle the first big sculpture! Our glacier cruise seemed like the ideal time to attempt eagle photos. I wanted the environment to feel natural and the scenery to be amazing. As we crowded onto the tour ship, I quickly got out my balloons and began sculpting. Unlike most of The Inflated Story of Noah sculptures, I had made an eagle several times before. I was a Carson-Newman Eagle in college and designing our mascot had been a fun challenge. I wish I knew how many strange looks I got when I started sculpting that tour boat eagle! Imagine my short, leathery-skinned, boat mechanic father holding a fishing pole eagle kite on the edge of a tourist boat. 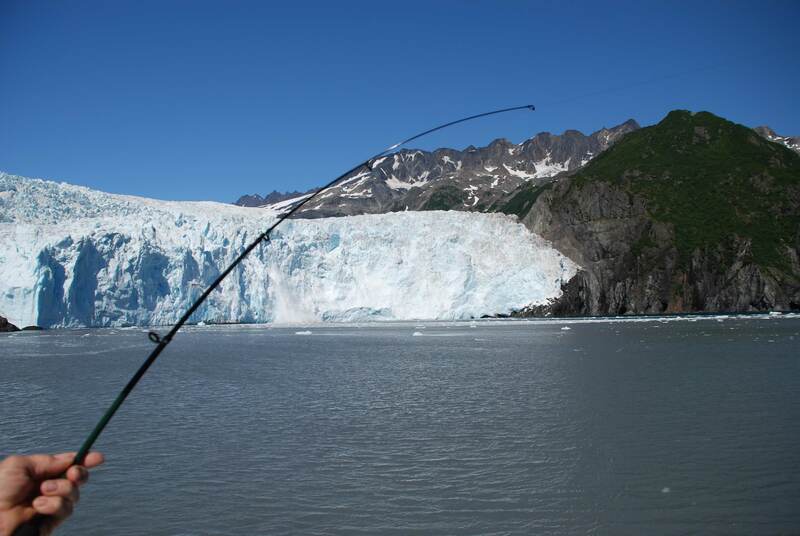 When the ship arrived at the glacier, the real fun began. I attached fishing line to my eagle, as if it were a kite, and had my short, leathery-skinned, boat mechanic father hold the “kite” so I could photograph it. Did you know the breeze from a glacier is great for kites? I was able to get phenomenal pictures of the eagle flying! When I first started sculpting animals to photograph in real places for the book, I hoped to get each animal sculpture in a picture with the real thing. I succeeded with a few of them, including the eagle! 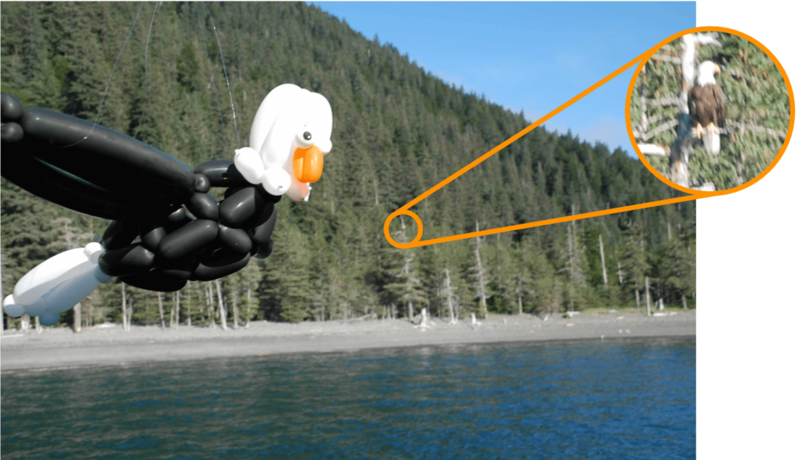 On the way back to shore, we spotted an eagle perched in a distant tree and I was able to pose my balloon eagle with the real thing. The captain even allowed us to stay in that spot longer than scheduled so I could get extra photos. Since the live Eagle was over 100 yards away, those weren’t my best shots, but it happened! Near the end of the day we finally spotted a live eagle in the distance. It was too far away to be more than a dot in the background, but I got it! Throughout the day, I continued to take pictures of the eagle in each scenic place that looked remotely worthwhile. In the end, I think you’ll LOVE the photos that show up in the book. Hopefully the pictures I have included with this post will give you a hint of what is to come.